It's the most wonderful time of the year, and everyone is in a giving sort of mood. I know I just wrapped up a giveaway, but how about some more holiday cheer? 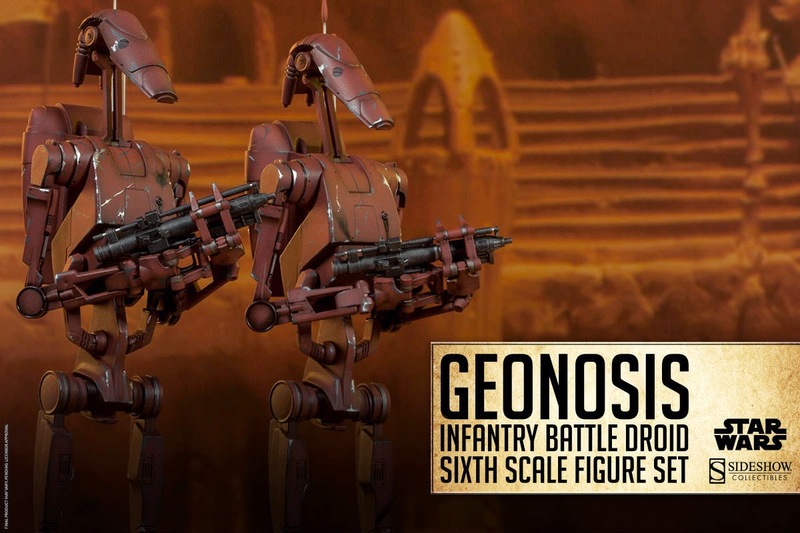 This time you've got the chance to win a a set of two Geonosis Infantry Battle Droids from Sideshow Collectibles - a $129.99 retail value! 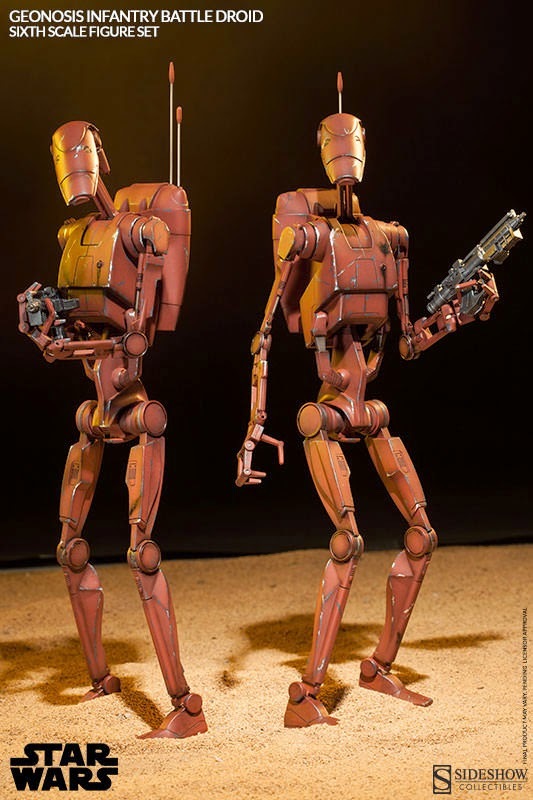 The sixth scale figure set features the droids seen in Episode II: Attack of the Clones with plenty of hand-crafted and articulated detail. All you have to bring to the party are some battle droid level jokes. Roger, roger. This giveaway will run for a week so it will be a nice post-holidays present. Yay! 1. Worth a single entry: Comment on the post and tell me which Star Wars film is your favorite. Please note this contest is limited to US residents only. I'll notify the winner on Christmas Eve, December 24th. Even though I grew up with the originals, I love Revenge of the Sith. I have to go with Empire. Toss up between A New Hope and Empire. Can't wait to watch Force Awakens with the practical effects in full force. Oh, I clicked "I commented" before I saw that it was US only, but I can provide a US address if I win! And my favourite movie is A New Hope. The Empire Strikes Back of course! Return of the Jedi, all the way! It's fantastic throughout, but the end really sells it for me with awesome action (including the best space battle in any of the films) right alongside what I feel is the emotional high point of the saga with Luke, Vader, and Palpatine. Empire Strikes Back! Tauntaun Sleeping Bag FTW! Empire. It wowed me when I first saw it in the theater, and it still wows me--the original version, that is. Plus: so much great Han humor. easily Empire Strikes Back, but i've gotten a much greater appreciation for Return of the Jedi as i've gotten older. Most definitely Episode V - The Empire Strikes Back! Who doesn't love the Battle of Hoth? Empire Strikes Back. A classic! The Empire Strikes Back...the best!!! Empire Strikes Back is my favorite! Love the originals, but have a huge soft spot for Attack of the Clones, don't judge me! Haha. Revenge of the Sith but it changes. I love them all. Empire Strikes Back is the BEST!!! If I have to choose one, A New Hope....since it was the first I saw as a kid and began my obsession. Ok not sure if it posted before...but Empire Strikes Back is my favorite. However, I do love the prequel trilogy, particularly Episode II with all the nostalgia (homestead scene, the Fetts). Please pick me!!! I love the Geonosis battle droids!! When I was a kid, I used to be terrified by the garbage compactor scene in Star Wars: A New Hope. It is now my favorite movie of the series. Revenge of the Sith, just to look the birth of Darth as we knew him... yes, I can provide an US address ;-) Happy Holidays! No one can ever make a better star wars move better than Irvin Kershner. Rest In peace sir. Star Wars A New Hope. I have to give allegiance to A New Hope, because it is the one that opened up my life to the reality that there was REALLY more out there; and it was exciting! Like the previous releases of the Battle Droids, these make a GREAT edition to any collection. My only complaint, it a small one, they should make the blaster fit better in their hands.